Newest edition to the Knock out rose collection. Slightly more heat tolerant than the others and the younger leaves are a bronze red color. 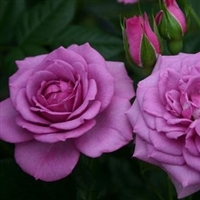 The Duet Rose Collection gives you multiple rose varieties in a single pot. 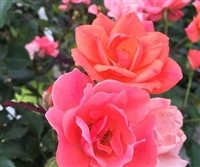 The rose bush will produce two different colored blooms, making for an eye-catching display. Soft peach blooms cover the plant from mid-spring to the first hard freeze of late fall. Easy-care, vigorous and cold hardy. Glossy dark green foliage with excellent disease resistance. Low spreading habit is perfect for smaller gardens, filling gently around established plants, in borders or along paths. Drift Roses are a cross between full-size groundcover roses and miniatures. They are tough, disease resistant, winter hardy, repeat bloomers, and virtually maintenance-free. Continuously blooming from spring to frost (bloom cycle is about every 5 to 6 weeks). Best low maintenance rose in the Knock Out Rose family.